'Mosella', the little Meuse, is what the soldiers of the Roman legions called the friendly river that rises in the Vosges and twists and turns end­lessly through low hills until it flows into the cool arms of Father Rhine. The laughing green hills were tempting for wine-growers and it is said that there were vineyards along this 'Mosella' even before the third century when Ausonius of Bordeaux, who imparted the noble art of rhetoric to the sons of Roman emperors and generals, wrote lyrically of the green vineyards near Trier: 'I believe that wild satyrs and blue-eyed nymphs meet here on the banks of the river'. Over the centuries the Mosella has become the Moselle, and its crazy twists and turns have been tamed. But the vines still climb upwards along the steep, dark, slate slopes. As soon as the Moselle forms the border between Luxembourg and Germany it becomes a wine river. Apart from Germany, Luxembourg also produces excellent Moselle wine. And at Trier the Moselle arrives on German soil. It remains a wine river as far as Koblenz. The steep hills are black in winter and in the early months of the year, green in spring and summer and gold in autumn. Small towns and villages full of black and white timber-frame houses with red geraniums, Weinstuben everywhere, where you can sit at a dark wooden table drinking an enormous quarter-litre 'Schoppen' of golden Moselle wine, where you can order a Winzerplatte to go with it, a wooden platter of dark country bread and superb sausage. Because all these simple little Moselles taste exquisite, light, fragrant and fresh as an accompaniment to anything that comes from the pig. The best Moselles grow on the Mittel-Mosel, which with all its twists and turns covers about sixty kilometres in a space of scarcely thirty kilometres as the crow flies that stretches from about Schweich to Enkirch. This is where you will find all those famous villages: Trittenheim, Neumagen, Dhron, Piesport, Wintrich, Brauneberg, Bern­kas­tel, Uerzig, Kröv and Traben-Trar­bach. In the year 1787 Elector Clemens Wenzeslaus of Trier decreed that henceforth only Riesling vines could be planted on the Moselle. This was a very wise decision because Riesling thrives in the weather-beaten slate of the Moselle hills and is at its best in this cool northern climate. A fine Moselle wine is a small miracle of sweet floral fragrance, delicate, girlish slenderness and springlike fraîcheur. Although Moselle wines are almost always drunk young, the fine qualities of good years with a lot of acid are left to mature. Along the Obermosel and Untermosel, however, varieties other than Riesling vines are grown, including Elbling and Müller-Thurgau (Rivaner). Almost all of the vineyards give you the opportunity to taste their own wines and visit their wine cellars. Of course you can also buy your wine there to enjoy later on the aft deck of your Linssen. The distinguishing feature of Schweich near Trier on the river Moselle is the former "Fährturm" (ferry tower) dating from 1876. Up to the beginning of the last century this tower was linked to the opposite bank by a cable and the ferry drew itself along this cable to the other side. This ferry was in use until the Moselle bridge was built in 1906. Schweich is also the birthplace of the famous writer Stefan Andres. The works of this German author have been described as the "most read" in post-war Germany. In his book "Der Knabe im Brunnen" (The Boy in the Stream), Andres tells humorously and imaginatively of his childhood in Schweich. Translated into dozens of languages, it is still being read all over the world. In the town centre there is a fountain, erected to commemorate his historical works. Many of the original manuscripts are still extant. In addition, a real water sports paradise for a true Linssen enthusiast can be found near to Schweich's "Fährturm". The tower is the attention-grabber for the “Boote Kreusch” marina which can accommodate as many as 180 (preferably Linssen) yachts from 5 to 17 metres. The comprehensive list of ser­vices offered includes servicing and indoor or outdoor winter storage as well as the moorings for all Linssen owners. The Moselle and Schweich have even more in common with Linssen Yachts, as it is the home port for Boote Kreusch. 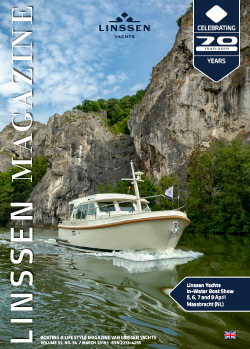 Boote Kreusch represents Linssen Yachts in Luxemburg and the western part of Germany (Rheinland Pfalz). In order to be able to service the larger Linssen yachts a 47-Ton boat trailer was put into service.